In our country we don't really celebrate Halloween. There are some Halloween themed parties, but it's definitely not on a you-must-dress-up kind of level. 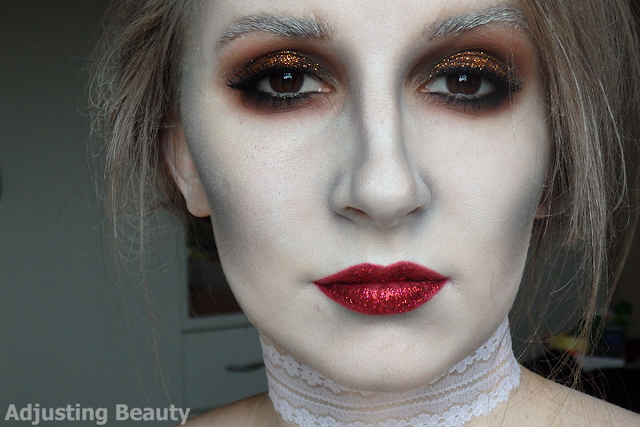 I find that this holiday is a good excuse for beauty bloggers to release their creativity. I too, sometimes get those urges of doing something different and that is how I came up with this a bit more glittery, glamorous ghost version. 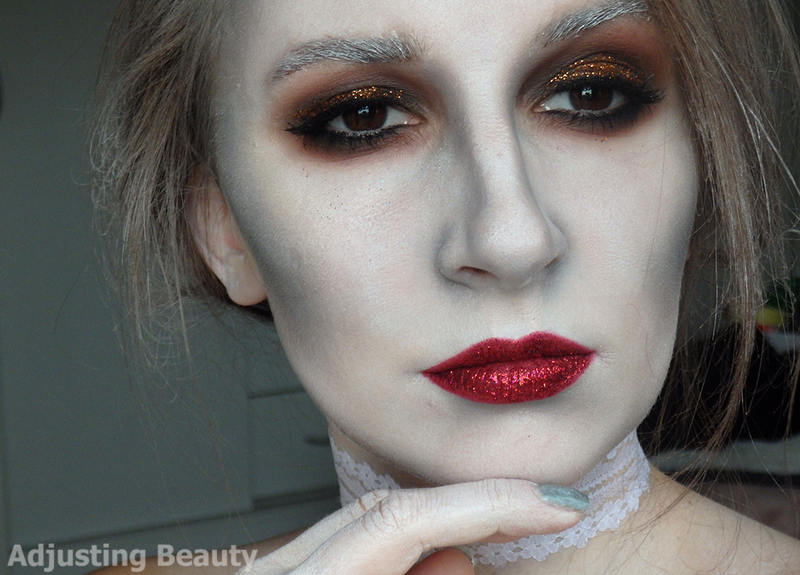 It's really easy to recreate and even might be a last minute Halloween idea. I started my makeup by applying white face paint that I bought in a drugstore. I also added a bit of contour all over the face to get some dimension. Later, I deepened all the contours. 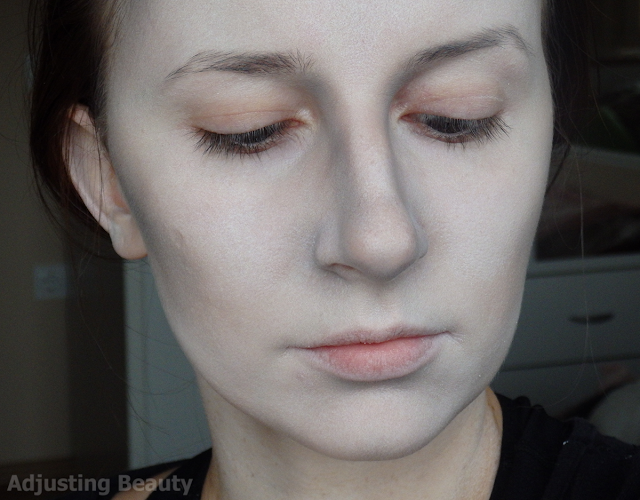 For the contour I used a bit of grey brown as a base and I also went over with a light and a bit of dark grey. It will give your face dimension and make you look dead. I added contours along my nose into the brow, on my jaw, under cheek bone, around hair line and under the lower lips. My eyes needed to look dark and somewhat soar. That's why I applied beige matte shade all over the lid. Then I took warm brown and red brown and defined my crease with it. You don't need to be precise with that. It's just gonna give you some shadow and depth. I applied it in a rounded shape. Then I used dark plum to further deepen it. I used matte black shadow on the lid and a bit into the crease. On my lower lash line, I repeated the same steps. Because this is a glamorous ghost, I also added a black winged liner. This will also hide the band of false eyelashes, which I added later, because I wanted to have a bit more impact on the eyes. I also applied coppery gold glitter on the center of the lid. I added a bit of black eye liner around the lower lash line. If you can, apply it in the waterline. This will make your eyes ever darker. But my eyes are too sensitive for me to do this. 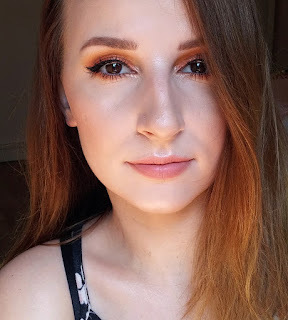 I also applied a bit of mascara to my top and lower lashes. I did my brows the usual way and then I took a spoolie and white face paint and ran it through my brows. It gives you dusty effect, like you've been gathering dust for years. As I've mentioned before, I deepened my contour after I finished my eyes. 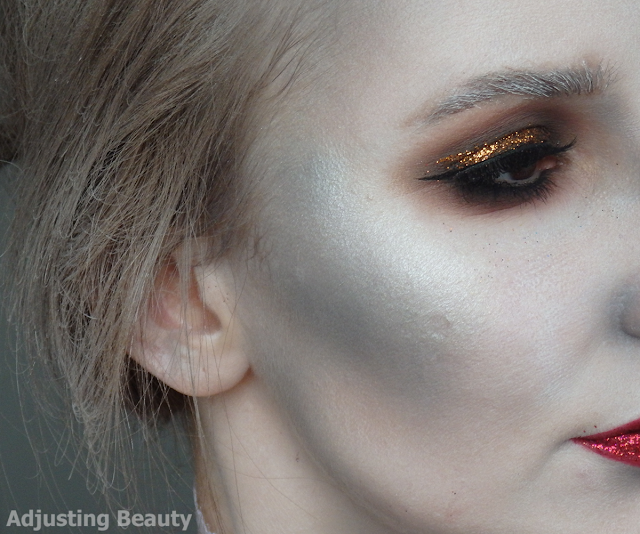 For a bit of a glam, I also added some highlighter with a white sheen, but only on the tops of cheeks. On my lips I used two shades of lip liner. First I used darker plum based red all over the edges and in the corners. On the center of the lid I used lighter red for just a bit of ombre. I went over it with a red glitter. 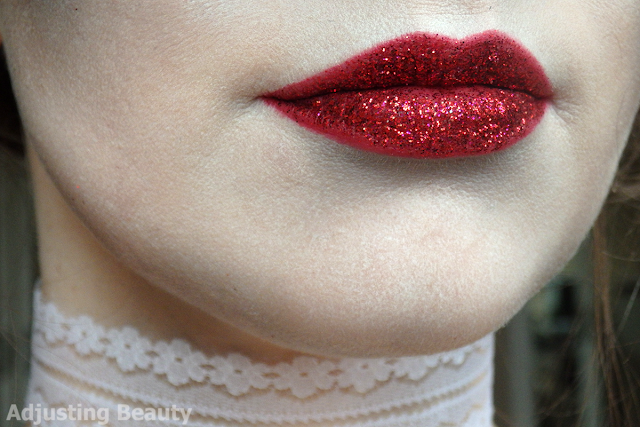 I also did the same in my Red Glitter Lips makeup look. I decided to put my hair in a little bun. As for making them white or dusty looking, it's really easy. Just take some of that trusty dry shampoo and go crazy. I knew my Batiste stock would come in handy some day. If you don't have dry shampoo, try some baby powder. It's really cheap. I would pair this look with some sort of white clothing. You can make the dress yourself, like I did mine for Ice Queen. Don't forget to paint your ear and hands, because you want to look uniformed. I think this look is really easy. 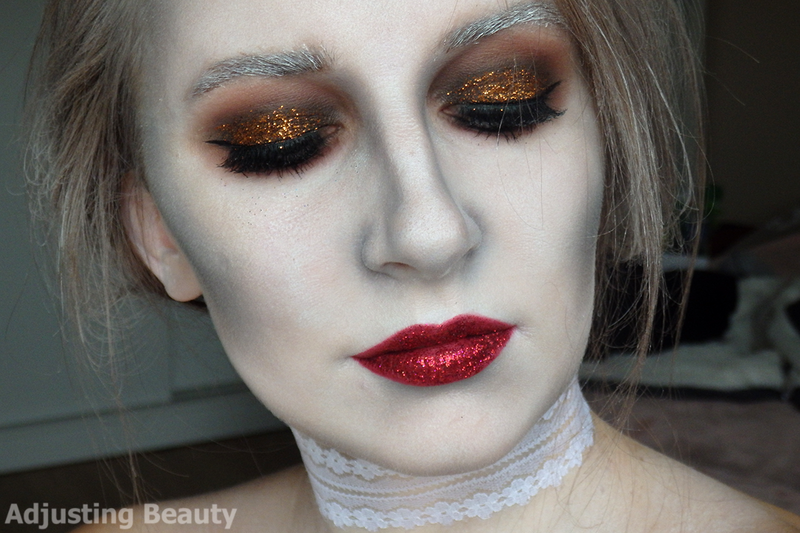 If you own any kind of makeup, you'll only need to buy white paint and some glitter. 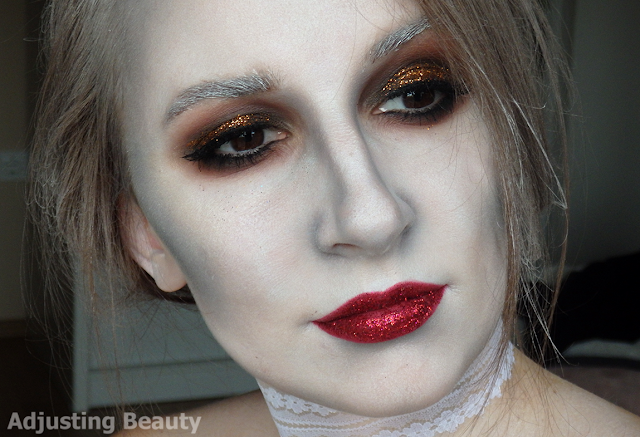 It's my take on a bit more glamorous ghost. 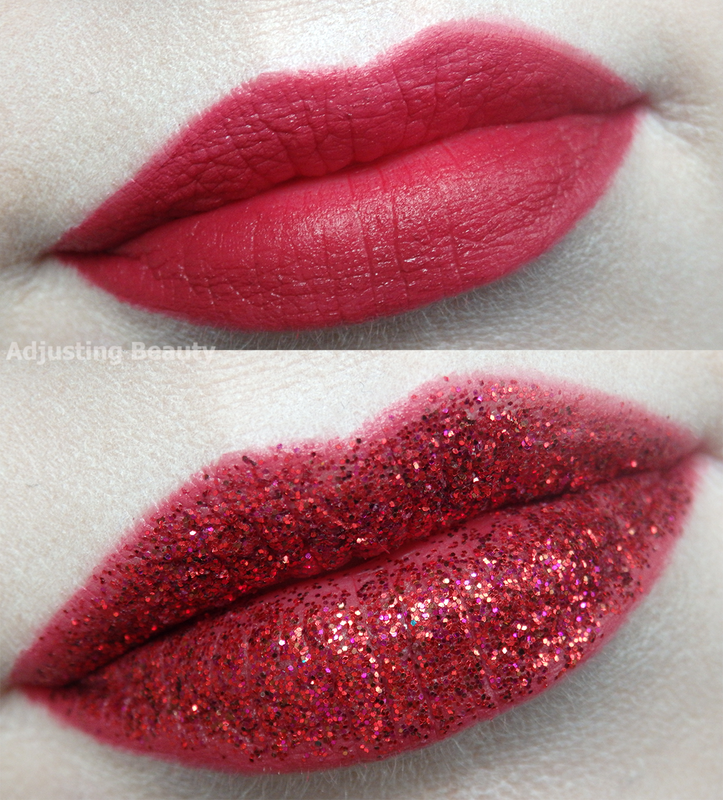 Instead of looking just dead and dusty, sparkle with some glitter. It doesn't require any real skills. 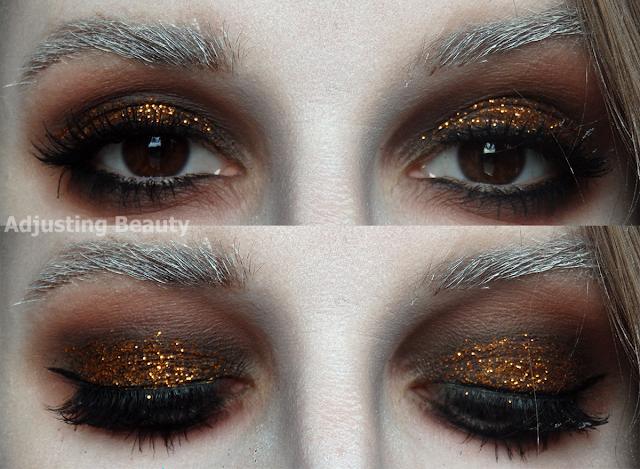 The messier eye makeup looks, the better. What do you think of this look? Would you wear this to your Halloween party? Hvala :) <3 Res je enostavno. Ne zahteva niti neke natančnosti. 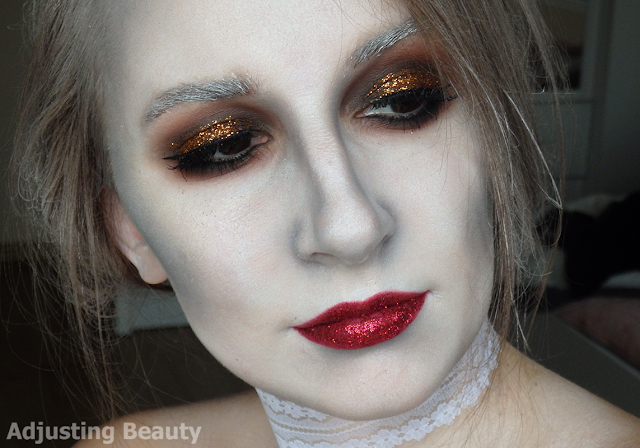 Ko pa dodaš glitter, pa takoj izgleda več kot je :).